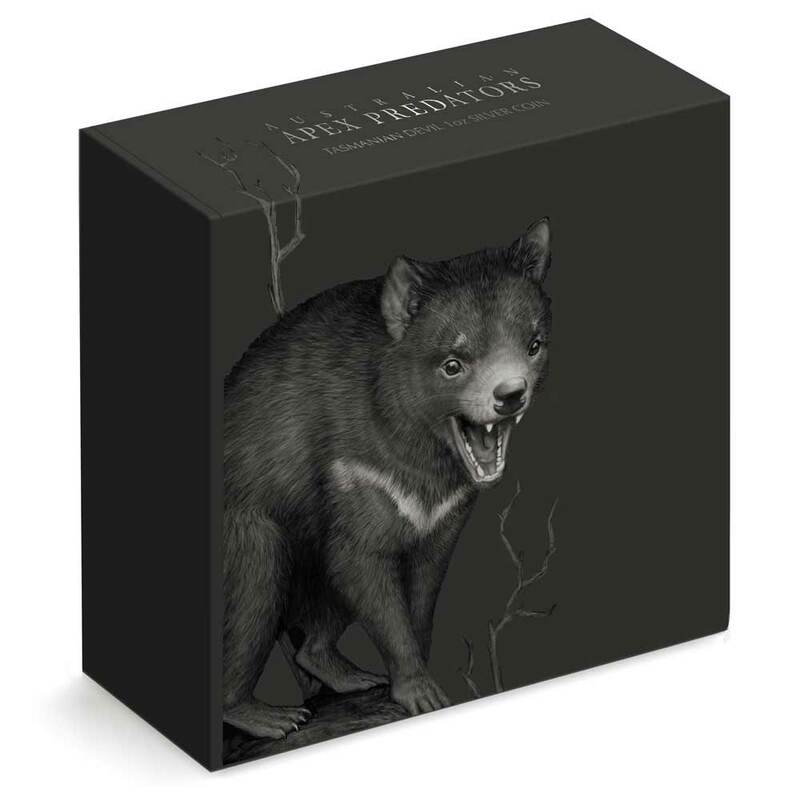 Now complete, Apex Predators is a series of five silver coins depicting those animals that reign at the top of the food chain in Australia, a country full of candidates for that throne. Released by the Australian Gold & Silver Exchange (AGSX), formerly Coin Club Australia, all of the coins are dated 2016 and were released over that period. We’re fortunate in that of all the places on this planet, Australia has such an interesting, unique and diversified bunch of killers from which to choose some perfect numismatic subjects. Not the first to go this route, the Perth Mint’s Deadly & Dangerous being another notable example, we think this one is the best out there. Choosing to go with a portrait-orientated rectangular format instead of round, this simple change has meant the artwork is unrestrained by a shape that is often quite difficult to utilise effectively when portraying wildlife. The proof is there for all to see. The artwork by Elise Martinson, a Sydney-based illustrator also responsible for the Bush Babies and Mythical Creatures series, is quite beautiful, not a weak one amongst them. 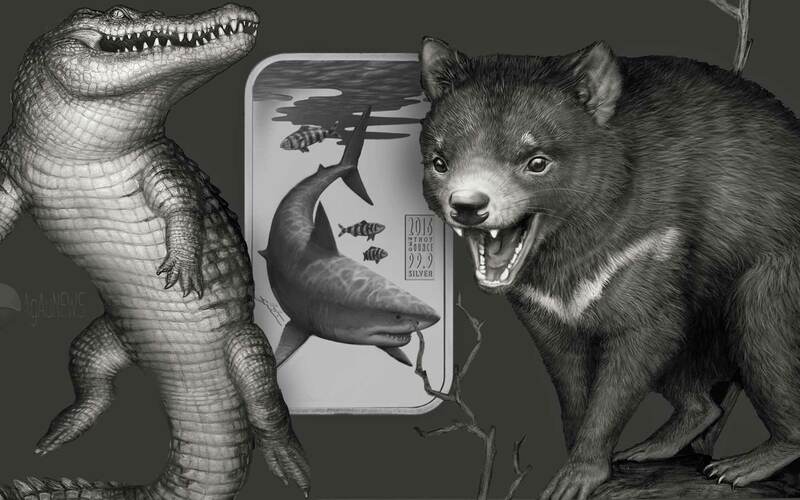 Indeed, we’d go as far as to say that each is one of the finest depictions of that animal to be seen on a numismatic, especially the shark and the crocodile. While they’re coloured, the range is limited to greyscale only which works very well. Only a small rectangular area with the date and composition inscribed within it is a distraction. The artists signature is also discretely inscribed. The obverse is typical for a Cook Islands issue. As a Commonwealth state, the effigy of it’s head, currently Queen Elizabeth II, is a requirement for the coins and here it’s present in the form of the very popular Ian Rank Broadley penned portrait. Her name, the issuing state and the denomination complete the picture, along with the date again (why?). Packaging is also first-class. Each is supplied in one of the innovative latex ‘floating’ frames that allow a coin to be clearly seen from all angles. 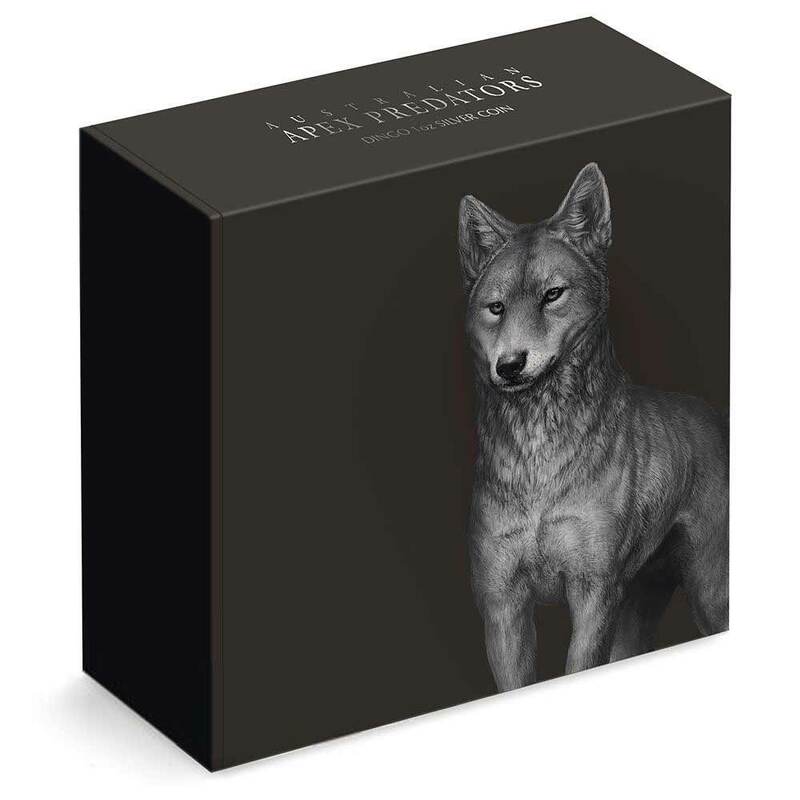 The outer shipper is decorated with a version of the coin artwork and also look quite superb. Struck in an ounce of fine silver measuring 50 x 29mm, the whole series is a credit to those involved. 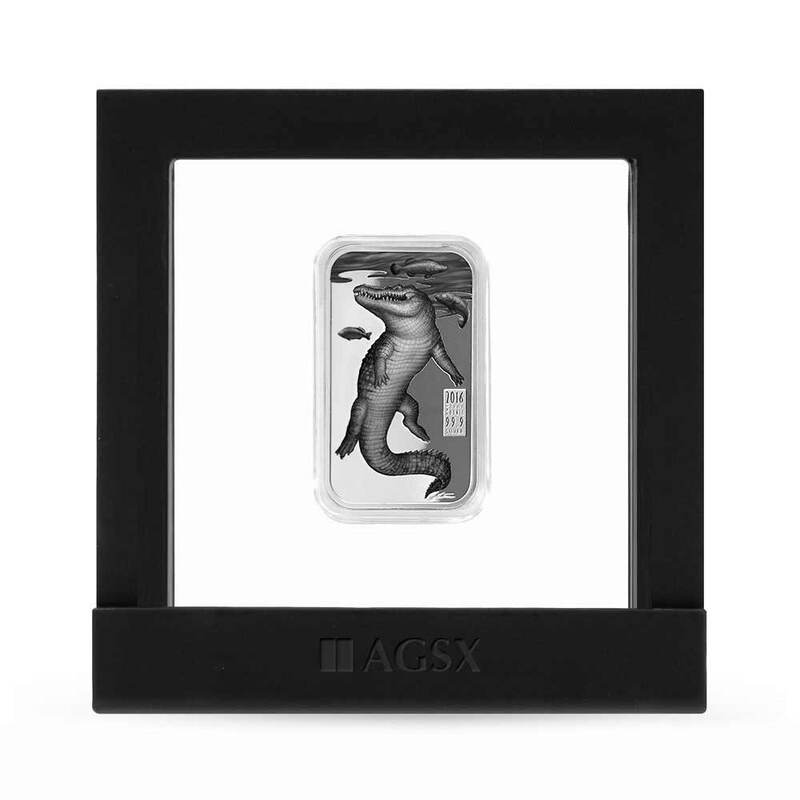 At the time of writing, all were still available from AGSX in both standard and artists signed variants, the latter limited to just 25 pieces from each 2,000 mintage and being autographed by Elise. It’s also a credit to AGSX that they’ve put aside a small sum from the sale of each coin to go to a wildlife conservation organisation. It’s long been a bugbear here that in a market awash with endangered animal coins, often at very high prices, very few mints give anything back. A $1 from every coin sold in this range is sent to the Taronga Conservation Society Australia, a non-profit working for wildlife conservation in Australasia and Africa. We’re sure collectors will be good with that. Only Numiscom with its Cheetah DNA coin does something similar. 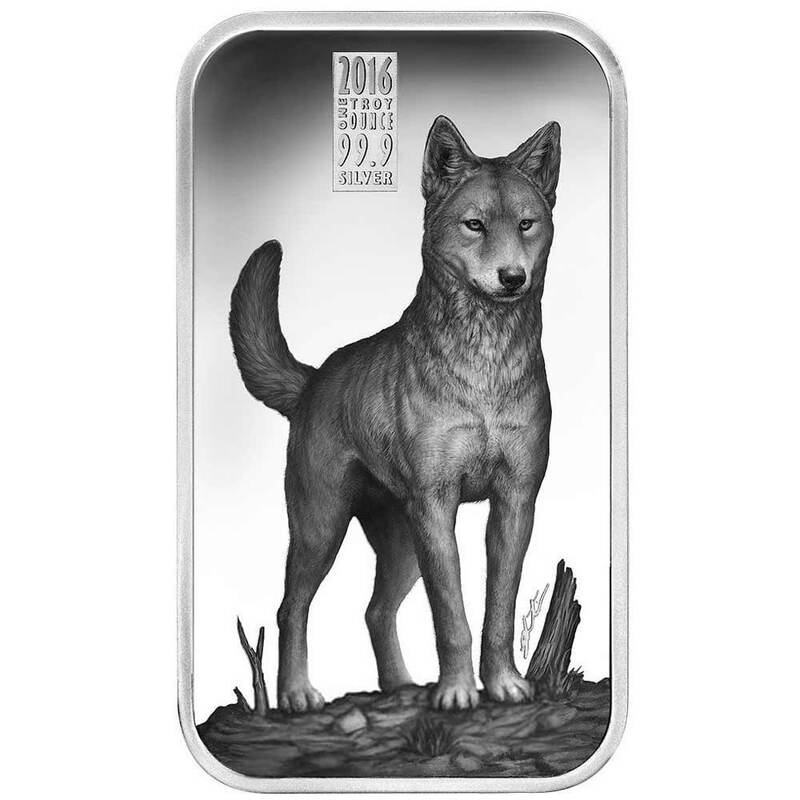 A beautiful coin series that collectors of wildlife numismatics would do well to look at. 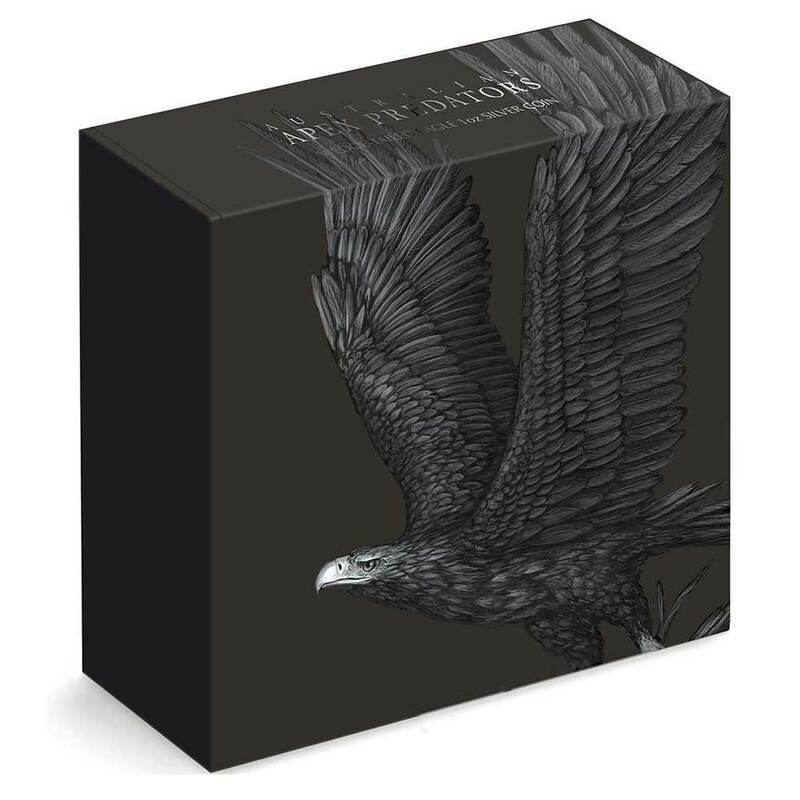 This first piece to be released in the Apex series is the wedge-tailed eagle, Australia’s largest bird of prey and among the largest eagles in the world. Its name derives from its distinctive diamond-shaped tail. With a broad wingspan reaching more than two meters, the wedge-tail soars into the sky, up to two kilometres above open areas of forest, on thermal drafts. From this height, the wedge-tailed eagle uses highly sophisticated binocular vision that enables it to assess distances accurately and pinpoint prey. Its vision is enhanced by bony rings around the eyes that change the shape of the eye to enlarge images. The effect is that of a telephoto lens on a camera. Sighting prey, the wedge-tail swoops decisively. Over thousands of years the wedge-tailed eagle has evolved into a formidable opponent. Hunting together, these eagles can prey on animals as large as adult kangaroos. With enviable pulling power, they can lift up to half their own body weight – making them a deadly opponent for live prey for whom their sharp claws and pointed beaks are no match. The wedge-tailed eagle feasts on fresh rabbits, kangaroos and small lizards, and it scavenges from carrion. 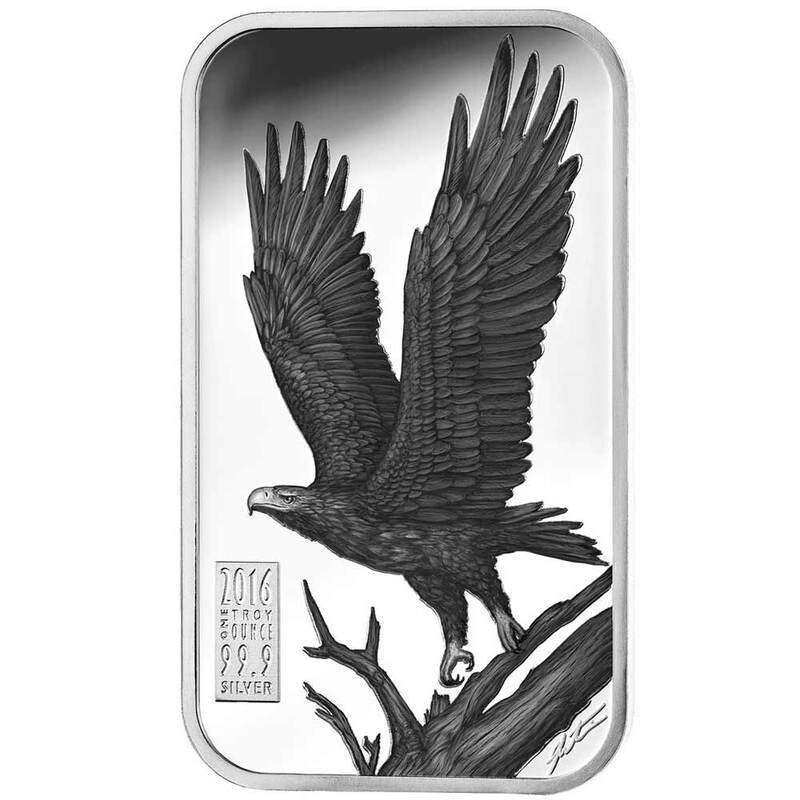 REVERSE: This coin depicts in detail the majestic wedge-tailed eagle taking flight. It also records the year of production, the signature of the artist Elise Martinson, and the coin’s weight and purity. This coin pays tribute to the dingo and its special place in Australian culture. This wild dog is our largest land-based predator and hunts more than 170 species, from insects to large mammals. Its main periods of activity are around dusk and dawn, and it tends to be nocturnal in warmer regions and less so in cooler areas. The dingo typically hunts alone but will form a pack in pursuit of larger prey. It generally howls, rarely barks. The adult dingo stands around half a meter tall at the shoulder and is over a meter in length from nose to distinctive white-tipped tail. Its colourings vary and are adapted to the range of habitats in which it lives – in desert areas the fur is a sandy colour and in forests a darker tan to black. With the dingo having been in Australia for thousands of years, the thickness and length of its fur is perfectly adapted to the environment. The dingo makes its home in abandoned rabbit burrows and hollow logs. Essential to its choice of den is the site’s proximity to fresh water although, when conditions are dry, the resourceful dingo survives on the liquids contained in its prey. REVERSE: This coin depicts in detail the formidable dingo surveying its territory. It also records the year of production, the signature of the artist Elise Martinson, and the coin’s weight and purity. The third coin in the Apex series is the great white shark, a remarkable creature that is much misunderstood as a result of both legend and popular culture. The world’s largest predatory fish, the great white roams cool, coastal waters including those off southern Australia. It is now protected internationally as research increasingly recognises the value of this magnificent species at the top of the marine food chain. The great white has been measured up to 6.4 metres. It has a powerful tail shaped like a torpedo that allows it to push quickly through the water; it is an excellent swimmer and can reach speeds up to 40 kilometres per hour. To support its size an adult great white will consume mainly sea turtles, sea lions, small whales, and seals. It employs its acute sense of smell and picks up tiny electromagnetic fields as prey moves through the water. 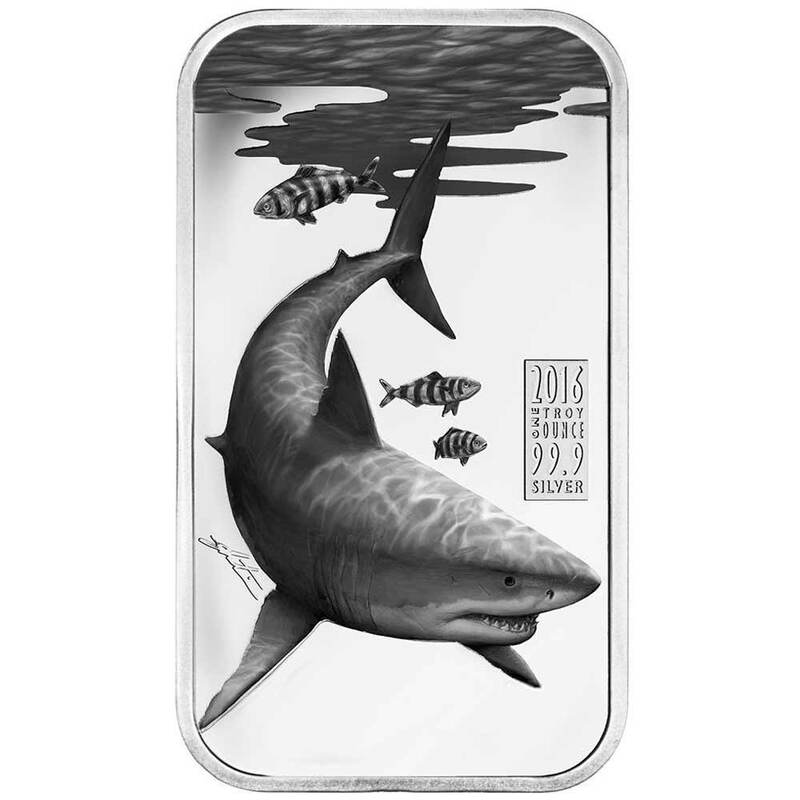 REVERSE: This coin depicts in detail the deadly great white shark accompanied by pilot fish. It also records the year of production, the signature of the artist Elise Martinson, and the coin’s weight and purity. 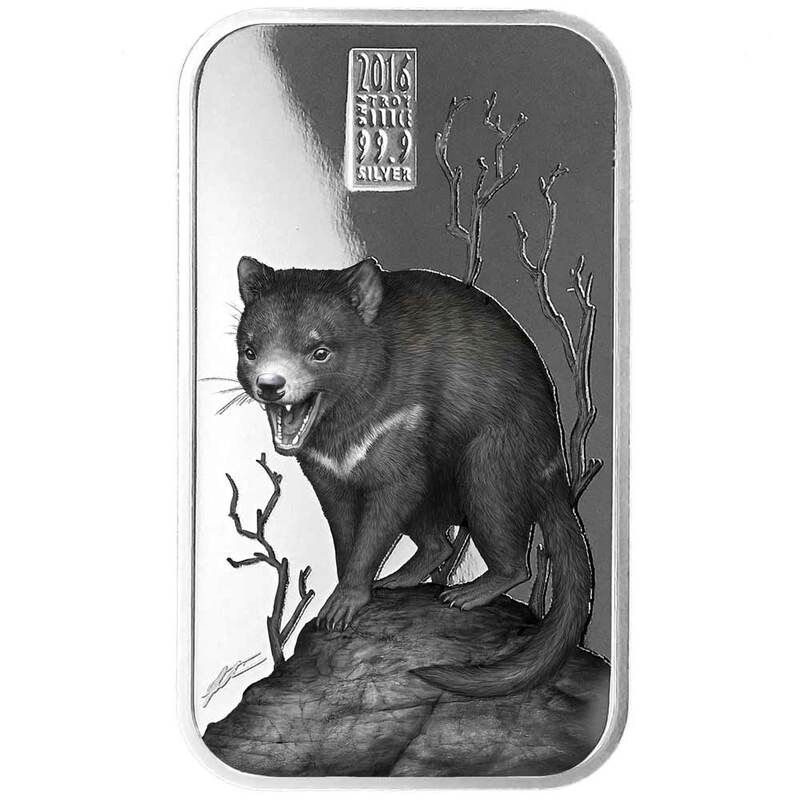 This coin recognises the significant role of the Tasmanian devil in Australia’s colonial history and its fierce reputation thanks to its aggressive appearance and sound. The noisy devil is best known for its range of threatening screeches, coughs, sneezes, and snarls – these combine with a short, solid build and generally dark fur to create a fearsome image. The nocturnal Tasmanian devil is an unfussy eater. From the mountains to the coast it hides in dens or thick bush during the day then travels long distances at night in search of prey and carrion, returning eventually to its home range. On the menu is anything from birds and insects to wallabies. The Tasmanian devil is principally a scavenger; using its strong jaws and teeth, it leaves nothing to waste. Once living throughout Australia, the Tasmanian devil is now found only in Tasmania and is an icon of the state. The species has been wholly protected since 1941 after early settlers hunted it to near extinction. In recent years Tasmanian devil populations have been blighted by Devil Facial Tumour Disease, yet the animal remains the world’s largest surviving carnivorous marsupial. REVERSE: This coin depicts in detail the fearsome Tasmanian devil letting out a snarl. It also records the year of production, the signature of the artist Elise Martinson, and the coin’s weight and purity. 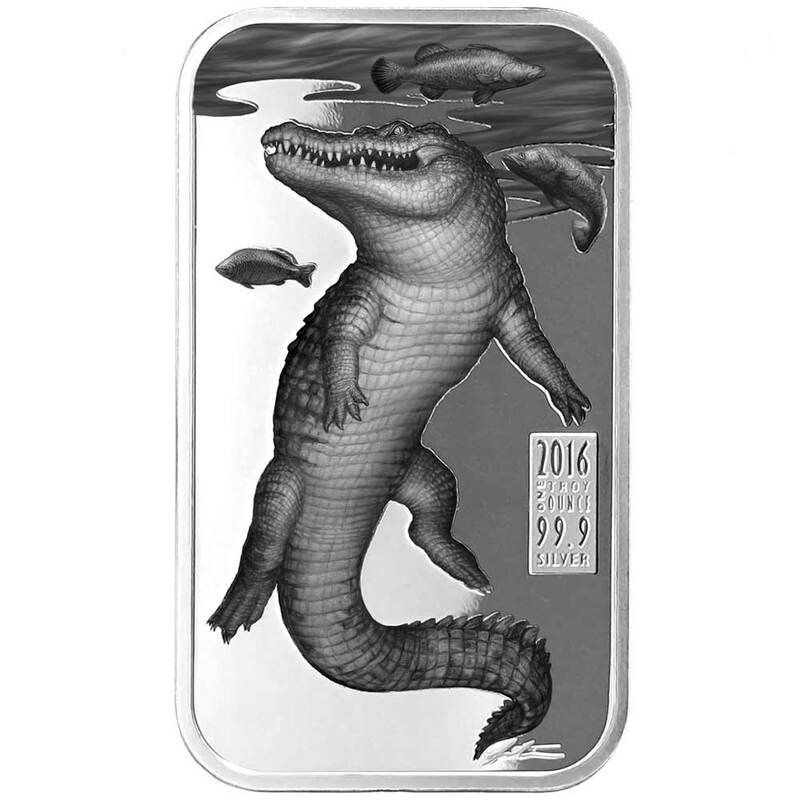 This coin celebrates the awesome power, stealth and strength of the world’s largest living reptile, the saltwater or estuarine crocodile. The “salty” is a highly effective opportunistic predator, lurking in the brackish waters of north Australia and swimming large distances, even out to sea. It can also be found in deep, murky freshwater swamps, rivers and billabongs far inland. When prey approaches the water’s edge, the patient, still, saltwater crocodile attacks with lightening speed. It uses its large head and heavy jaws to drag its victim under the water until it drowns. Depending on its size the saltwater crocodile will attack anything in its reach, including turtles, birds, small mammals, and fish. For a large adult male, a one tonne water buffalo or wild pig may also be fair game. Average-size males are an impressive five metres long and weigh 450 kilograms. The female saltwater crocodile lays 40-60 eggs in freshwater areas, usually during the wet season. A small number of hatchlings will survive, and because of their territorial nature the adult males will eventually force the young ones out to find their own unoccupied turf. REVERSE: This coin depicts in detail the powerful saltwater crocodile lurking underwater. It also records the year of production, the signature of the artist Elise Martinson, and the coin’s weight and purity. From their commanding position at the top of the food chain, apex predators reign supreme. Without enemies to hunt them down in the wild, these elite predators occupy a unique position in the environment, maintaining ecological balance and order. 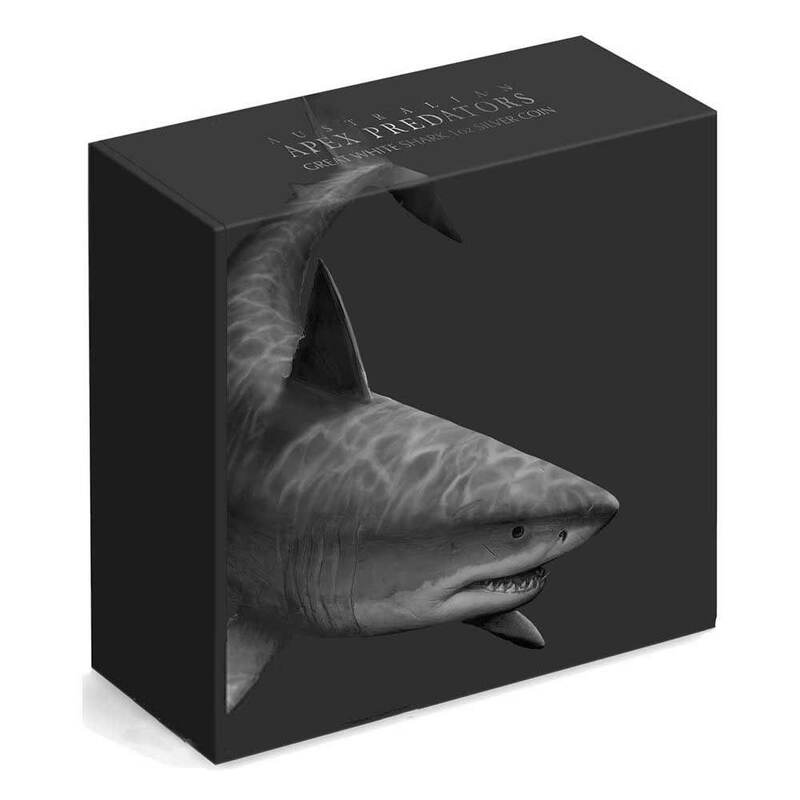 The Australian Apex Predators series celebrates the powerful skills and unusual anatomical features that enable these animals to stand apart. The precision with which these animals hunt is matched by the detailed illustration in each piece. Meticulously reproduced in black and white, the defining attributes of the apex predators are revealed. 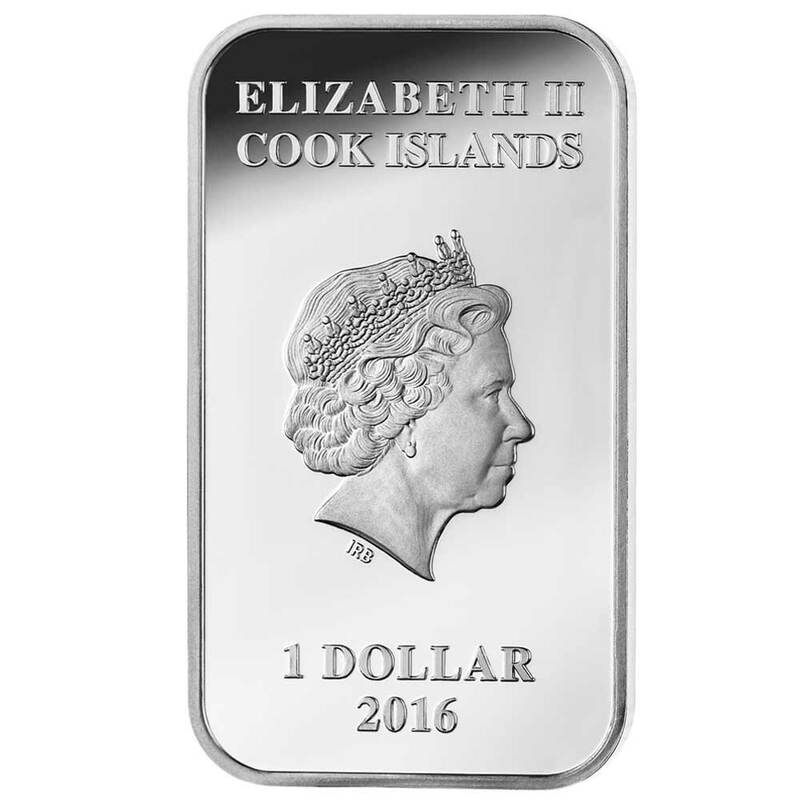 OBVERSE: The obverse design includes the Ian Rank Broadly effigy of Her Majesty Queen Elizabeth II, as well as the country and date of issue, and the piece’s value in Cook Island dollars. 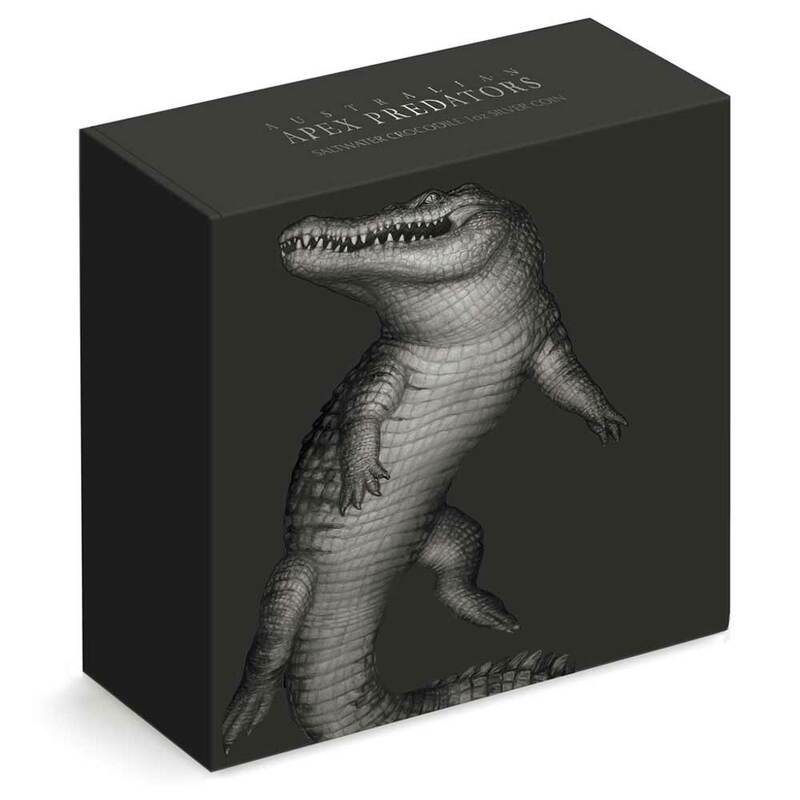 Your purchase includes a $1.00 donation to the Taronga Conservation Society Australia who are working to secure a shared future for wildlife and people.